UNIVERSAL 22.75"X11"X3 FRONT MOUNT INTERCOOLER TURBOCHARGE BAR & PLATE TURBO. JDM Sport race spec universal intercooler. Made By OEM Approved & ISO Certified Manufacturers With Materials That Meets Or Exceeds Strict OEM Requirements. 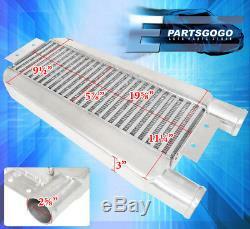 22.75''x 11''x 3 High Flow Intercooler for Turbocharger and Supercharger. Core Size: 19.5" x 5.75" x 3" with 2.5" inlet/outlets. 100% TIG WELDED using casted aluminum end tanks allowing it to withstand high internal pressure. Square High Flow Bar and Plate Design. PSi Drop under 0.2. Other Intercooler usually drop 2 Psi Some are More. Max PSI is 40 Up to 600HP. This listing is only for the intercooler. There is no pipes, clamps, or coupler. No Installation Guides Are Included, We Highly Recommend To Seek Professional Installation. Universal Fit (Please take correct measurements to make sure it will fit in the location). Insufficient information will delay the order process so please read the invoice carefully during checkout. Ground Carriers do not deliver to PO BOX (additional charges will be applied unless a physical address is given). We do not mark merchandise values below value or mark items as "gifts" - US and International government regulations prohibit such behavior. Return labels are not given to return these items. We do not offer local pick-ups. Replacements will not be sent until the claim is approved. Instructions are not included unless stated in the description. We are retailers of the parts and are not trained technicians. We can provide minimal support, but we will try our best to help. NOTE : All of turbo parts and performance may require slight modification in order to fits perfectly. Most aftermarket items are produced for off-road or show purpose only. These items are not suitable for regular driving. User must follow the direction given and any misuse of this product is at his/her own risk. The item "UNIVERSAL 22.75X11X3 FRONT MOUNT INTERCOOLER TURBOCHARGE BAR & PLATE TURBO" is in sale since Wednesday, April 6, 2016. This item is in the category "eBay Motors\Parts & Accessories\Car & Truck Parts\Turbos, Nitrous, Superchargers\Turbo Chargers & Parts". The seller is "epartsgogo" and is located in La Puente, California. This item can be shipped worldwide.